I guess the biggest caveat to this book review is that the author of the book I’m about to review is one of my personal heroes. About 5 years ago, Will McInnes got me excited about working in digital and I thank him for that to this day. Will is one of those guys who knows what he’s talking about, but does so in a warm and completely unpretentious way. In “Culture Shock”, Will McIness outlines how we can all make our workplaces more democratic and transparent. The book provides readers with a number of practical ideas to consider, varying in degrees of ‘radicalness’, in relation to changing the way in which businesses are run and employees are being involved. Having A Purpose of Significance – As McInnes points out, the idea of having a purpose that drives an organisation isn’t a new one. However, the addition of the word “significance” is the bit that distinguishes 21st century organisations from the more classic organisational mission statements (see Fig. 1 below). More and more organisations are trying to broaden their aspirations and add more ‘meaning’ to their day-to-day activities. Democracy, empowerment and transparency – For me these three terms – democracy, empowerment and transparency – sum up a lot of the real-life examples and practical suggestions that McInnes highlights in “Culture Shock”. This becomes particularly relevant when you consider these terms from a technology point of view; using the Internet and dedicated software to ‘open up’ your organisation and decision-making. McInnes provides readers with numerous examples varying from companies opening up their Application Programming Interface (‘API’) to organisations using collaborative software like Yammer and Basecamp. Crowdsourcing innovation and marketing – The likes of Kickstarter, Pledge and Innocentive clearly show the growing popularity of crowdsourcing, getting the ‘crowd’ involved in (funding) innovation or in marketing. In “Culture Shock” McInnes makes a strong case for the value of collaboration and for engaging directly with customers. Openness (1) – I know it’s easier said than done, but I absolutely LOVE the points McInnes makes about the kinds of behaviours that come with workplace change. I picked up specifically on the suggested use of Buzz monitoring systems and on openness around ‘failure’. Buzz monitoring is the technology that searches the web for keywords of your choice. This helps companies in getting a better insight into the sentiment around their business or products. However, an important aspect of such systems is that they enable organisations to engage more effectively with customers. Good examples of such systems are Brandwatch and HootSuite. Openness (2) – As for ‘failure’, McInnes’ central point is that a greater willingness to fail will lead to greater levels of trust between people and will encourage organisational learning. A good example are the “Church of Fail” meetings at Nixon McInnes where employees can volunteer to stand up and describe a time that they failed in the last period. Having described their failure, the crowd will start cheering and clapping loudly. This ritual might not work for every organisation or individual but there’s something to say for sharing ‘failure’ and learning from it. “Tech DNA” – It was interesting to read what McIness considers a “technical DNA”. In essence, it comes down to organisations having an “embracing attitude towards the disruption and opportunity that technology creates.” The emphasis here is very much on using technology to learn more quickly, thus gaining a competitive advantage sooner than others. In addition, the idea is to involve people all the way through any technology initiative (and not making technology the exclusive domain of an IT or development department – see Fig. 2 below). 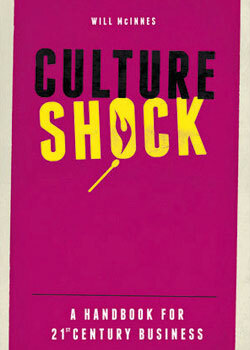 Main learning point: “Culture Shock” is a great read for anyone interested in changing organisational culture. The book provides some strong arguments for the value of making the workplace more democratic and transparent. McInnes illustrates his key points by looking at numerous companies who have introduced a different approach to things like decision-making and employee involvement. He also offers a lot of practical suggestions to consider in relation to making changes to the workplace. All in all, I found “Culture Shock” to be as inspiring to read as it is to listen to McInnes talk in real-life! Does our Purpose address a fundamental problem that is caused or exacerbated by this business industry? Does our Purpose lead to decisions which can surpress or limit short-term financial gains for longer-term achievements? Does our Purpose inspire a community to develop? Does our Purpose address a fundamental injustice in the world? Does our Purpose disrupt and positively revolutionise a whole marketplace? Does our Purpose fundamentally make the world a better place? It typically moves before its peers to experiment with technology. It usually takes an Agile/Beta approach to technology innovation and manages expectations accordingly. It always puts the human aspect of how the technology will actually be used and valued over the whizz bang feature set – prioritising user-centred thinking and involvement over tech-for-tech’s sake. Thanks for the mention of Brandwatch 🙂 Sounds like Culture Shock is a good read, will have to hunt it out!